As a stimulating herb Cayenne acts on the circulatory system spreading throughout, warming and toning the system. Cayenne can warm the periphery where there are cold hands and feet and open the pores to increase perspiration. Herbalist Matthew Wood says it is an herb that is useful when we age and, “the heart muscles are starting to become lazy and the circulation is getting stagnant in places.” Acting on the heart and blood vessels, Cayenne may be beneficial in increasing the strength of the pulse without affecting the rate. Cayenne increases metabolism, peristalsis and digestion while helping with the breakdown of carbohydrates and fats. Cayenne may be beneficial where there is a lack of function in the stomach or the intestines with poor appetite and weak digestion. As a carminative, Cayenne may be beneficial in helping to relieve gas and bloating or cramping of the stomach and bowels. Topically, Cayenne increases circulation at the surface bringing oxygen and nutrients into the area helping to expedite healing and relieving pain. In cases of sore throat a compress soaked in Cayenne may be applied to the throat while also taking internal doses. 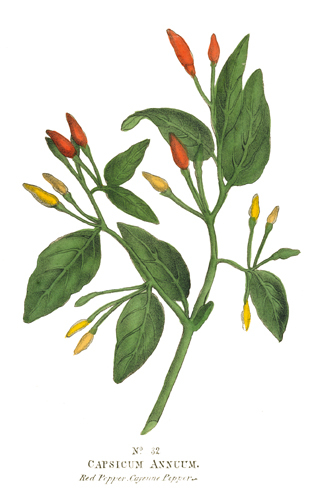 A diluted infusion of Cayenne can also be used as a gargle for tonsillitis and is indicated for hoarseness when the uvula is relaxed. Combine dried powdered herbs. Add 1 tsp to hot water; Indicated for colds, flu, fever and poor circulation. Make an infusion by pouring boiling water over the herbs and steep for 10 minutes. Strain off the herb and add the remaining ingredients to the sage and cayenne infusion. Use as gargle as often as needed. – In large doses it may cause vomiting and/or pains in the stomach and bowels.